Your shiny new prepaid Mastercard will arrive by post, ready for you to use online and in-store. Your card can emit a secure tone which will enable you to log in to the app, and in the future pay online. Use the Wega Mastercard for payments and cash withdrawals anywhere in the world. Win Wega points each time you use your card and access a world of exclusive experiences such as VIP tickets, signed Manchester City shirts, pitch-side passes and more. This prepaid Mastercard will arrive by post to your address, ready for your spouse, partner or family member to use online and in-store. This card can emit a secure tone which will enable you to log in to the app, and in the future pay online. 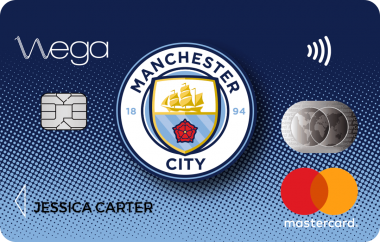 On top of that, additional cardholders will also earn Wega points for every £ spent on their card which are added to your Wega points balance to save up and access exclusive Manchester City experiences. This shiny new prepaid Mastercard will arrive by post to your address, ready for your child to use online and in-store. This card can emit a secure tone which will enable you to log in to the app, and in the future pay online. You can easily and instantly top up their cards right from your Wega app and see what they pay as all transactions appear right in your Wega app. 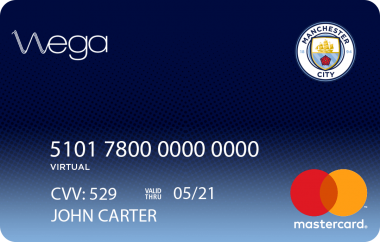 On top of that, they will also earn 1 Wega point for every 1£ spent on their card which are added to your Wega points balance to save up and access exclusive Manchester City experiences. With this option you won’t get a card sent to you in the post, but it will appear instantly in your Wega app. You will be able to use it straight away for any payments online, including your favorite services such as Amazon, Uber, Deliveroo, Asos and more. Only now, win Wega Wega points each time you use your card and access a world of exclusive experiences such as VIP tickets, signed Manchester City shirts, pitch-side passes and more.